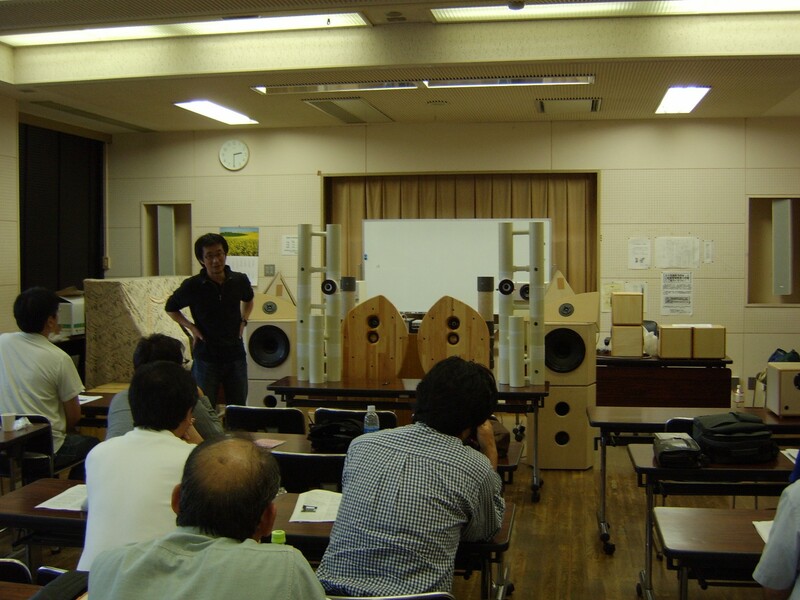 I am heading a small group named "Research Institute of Loudspeaker Systems and Related Technologies(RILSRT)". First conference was held on September 23rd, 2010 in Tokyo. It was open conference to public and anyone who wanted to join was able to join the conference. Twenty-six people came to present or just to audit the conference. This is presentation by Mr. Matsu. He is co-founder of this institute. This huge system is aimed to realize acoustic field using one 12" and two 10" full-range drivers for each channel. 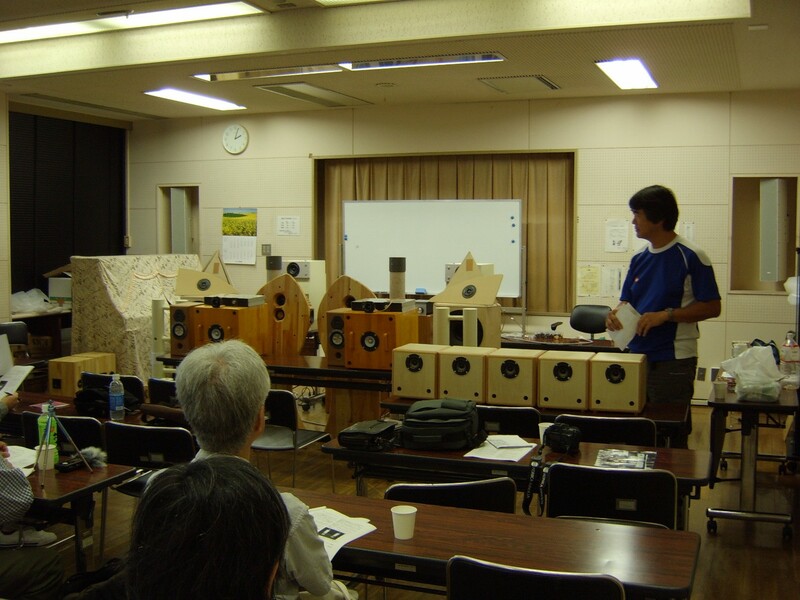 Its technology was based on NDR (Non-Dimensional Radiation) System developed by Mr. Kono in Japan. Enclosure type is standard MCAP-CR developed by myself..
Acoustic field was truly wondering. 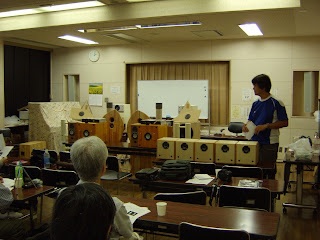 Regenerating chamber orchestra, acoustic field was spread not only forward field but also backward field. Size of violin was small enough and did not spread over while using these drivers. It was amazing work. Everyone who presented liked this system. Problem was that size was too big for personal residence. This was presentation by Mr. Kato. His work was white triple-pipe. He named this system "Twin-Tower". He used one 3" Tangband driver for each channel. Cabinet was made of mostly around 4" paper-pipe and some PVC pipe. Using 3" driver, this system regenerated powerful but soft low frequency sounds. Playing wood base CD, some ones sighed and told "I have never heard this base. It was really wonderful". This system did not cost much. Total cost excluding his labor was only 30 - 40 US dollar. Enclosure type was also MCAP-CR with four sub-chambers. I thank Mr. Osawa for his presentation. He was not a member of RILSRT. He developed four-sub-chamber standard MCAP-CR system. His system was at the very center of left picture. His work was practical. He used easily available box components for enclosure and made this system cost effective. His driver was 4" Tangband full-range. 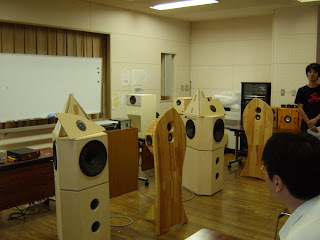 He added super tweeter in order to compensate for higher frequency response. Low range was powerful enough. Cross sectional area of external ducts was smaller than my recommendation, still performed well. It proved design flexibility of MCAP-CRs.